The relationship between the State of Israel and the U.N. Relief and Work Agency for Palestinian Refugees in the Near East (UNRWA)—an agency catering to an Arab population that could at best be described as unfriendly—is little known and little understood. Yet for UNRWA to operate effectively in the West Bank and the Gaza Strip, where the bulk of its constituency resides, it must interact and collaborate with the Jewish state, which has exerted overwhelming influence on these territories since the Six-Day War of June 1967. The result has been an uneasy marriage of convenience between two unlikely bedfellows that has helped perpetuate the problem both have allegedly sought to resolve. 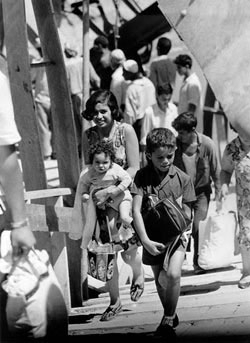 Arab refugees return to the West Bank, August 1967. One of the consequences of the 1967 Six-Day War was Israel's sudden jurisdiction over Palestinians living in UNRWA-run refugee camps. Rather than take over the management of this population, Israel formally recognized UNRWA's activity in the West Bank and Gaza. (f) Pending a further supplementary agreement, to maintain the previously existing financial arrangements with the governmental authorities then responsible for the areas in question. From 1967 until the first intifada in December 1987, there were no extraordinary tensions or major disputes between UNRWA and the Israeli military administration. However, relations took a turn for the worse in Israeli-UNRWA relations in the late 1980s and early 1990s as violence erupted in the UNRWA-administered refugee camps during the first intifada. The Israeli authorities concluded that some of UNRWA's employees were members or supporters of terrorist organizations and that its facilities were being used to support and carry out terrorist activity. UNRWA's operations had become exceedingly politicized with the agency promoting anti-Israeli propaganda—including the use of deeply troubling textbooks demonizing Israel—and advocating an uncompromising stand on Palestinian demands. UNRWA vehicles including ambulances were used to transport terrorists and weapons for terrorist organizations. The Israeli authorities demanded the arrest of suspects in these activities, but UNRWA insisted that its employees enjoyed diplomatic immunity. Jerusalem also demanded the right to stop and search UNRWA vehicles, but the agency objected and filed complaints with the Security Council. To protect the country, Israeli leaders deployed defensive mechanisms such as imposing curfews and increasing the number of checkpoints and travel restrictions applying to Palestinian employees of UNRWA. The agency responded by complaining that these security arrangements interrupted daily life and education in the territories. Tensions were reduced after the signing of the 1993 Declaration of Principles (DOP) between Israeli and Palestinian leaders and the establishment of the Palestinian Authority (PA) as the legally recognized governing body of the Palestinian Arabs. Israeli responsibility for the Arab residents of the West Bank and Gaza was transferred to the PA, and the relationships between the government of Israel and UNRWA greatly improved. As late as 1994, when control of the Palestinian population passed to Yasser Arafat's PA, Israel still provided more funding than all Arab countries except Saudi Arabia, Kuwait, and Morocco. This excluded funding of schools and medical care, which were a part of UNRWA's budget and not the responsibility of the Israeli government. On principal, Jerusalem did not involve itself in UNRWA's internal working procedures while the framework of the mandate was agreeable. Only when there were violations and differences of opinion about UNRWA's mandate, did Israel interfere. Most of the reasons were practical. The so-called second intifada (2000-05) once again saw violence occurring in and originating from UNRWA-administered refugee camps. Once more the Israeli government felt compelled to send in troops to quell violence and hunt down terrorists targeting its civilians. Once more UNRWA officials protested the incursions into their jurisdiction. Eventually, the Israel Defense Forces (IDF) gained the upper hand in suppressing terrorist activity in the territories, and a tense but quiet period took hold. Although violent clashes with the IDF have diminished in the territories since 2005, Gaza in particular has seen an escalation and an attendant rise in Israeli-UNRWA tensions. With the Israeli government's removal of all Jewish residents and defense personnel from the strip in the summer of 2005 and the subsequent Hamas takeover of the territory in June 2007, Israeli-UNRWA relations have gone through several trying periods. After some 6,000 rockets had been fired from Gaza at Israeli population centers in the south of the country, Jerusalem launched Operation Cast Lead in December 2008- January 2009 to strike back at Hamas and its allies. In the course of the fighting, scores of homes and other facilities were extensively damaged including, in some cases, UNRWA facilities. As expected, UNRWA noisily protested what it maintained were unwarranted attacks on its neutrality while the Israeli authorities argued that the agency had enabled Hamas operatives to use its facilities both as "human" shields and areas of operation. UNRWA also claimed that many Gazan students experienced posttraumatic stress following the IDF military campaign. However, the Israeli government allowed 243 Gaza residents to enter Israel for medical and humanitarian reasons via the Erez Crossing, and Israeli civilian hospitals were also prepared to treat the injured. In the aftermath of the fighting, UNRWA asked to be placed in charge of the reconstruction of damaged public buildings, schools, clinics, and housing projects. Forced to choose between allowing Hamas to carry out the reconstruction or work with UNRWA, Israeli officials preferred to partner with UNRWA, hoping this would prevent the Islamist terror group from obtaining dual-use construction materials. This, however, does not mean that whatever UNRWA desires becomes a fait accompli. The agency has submitted requests for more than 200 projects, only to have about half of them approved by the Israeli government. For example, UNRWA offered to manage the rebuilding of schools in a particular area, but Jerusalem rejected the proposal because the sites were too close to Hamas military posts and only approved the projects after UNRWA chose other sites. In 2011, the Israeli Army Spokesperson's Unit announced "widespread construction" in the Gaza Strip with the approval of 121 projects funded by international organizations, including UNRWA and the United Nations Development Program (UNDP). Israel is aware of the possibility that part of the construction materiel could end up in the hands of Hamas, but nonetheless views UNRWA as the lesser evil. By mid-2012, Israeli authorities had approved a number of new projects in Gaza. UNRWA has to receive a permit for every project that it wants to undertake and must provide assurances that Hamas will not profit or benefit from the construction in any way. Jerusalem has no control, however, over the bidding process and how companies are chosen by UNRWA to carry out the projects. The Israelis try as much as possible to pressure UNRWA to scrutinize and vet the contractors to ensure that Hamas is not involved with the companies that gain the contracts, but they cannot strictly supervise this. In the West Bank, there is daily liaison and coordination between the Israeli authorities and UNRWA, which in general work well. For the most part, there are no special problems in issuing permits for transporting local products or in the coordination of movements, treatment of special cases in times of border closures or security tensions, as well as supplying materials, food, and medical goods. There is also a mechanism for special humanitarian requests or needs that is activated on a regular basis. This view of the marginally better option of working with UNRWA is formalized through the activities of the Israeli office of the Coordinator of Government Activities in the Territories Unit (COGAT)—a bureau of the Israeli Ministry of Defense and a part of the General Staff. Its mandate is to implement "civilian policy of the government of Israel in the West Bank and vis-à-vis the Gaza Strip in coordination and conjunction with the prime minister's office, other government ministries, the security forces, and the IDF General Staff." It is in charge of cooperation with international agencies operating outside the territory of pre-1967 Israel and attempts to maintain a good working relationship with UNRWA, mainly to help the agency perform its task of providing vital services to the Palestinian Arabs. As such, COGAT is a forum that irons out differences and solves problems as they arise in the field. From June 1967 until the signing of the DOP, the West Bank and Gaza were under Israel's military administration. Subsequently, COGAT replaced the military administration in response to the political maneuvering of Arafat, who sought to internationalize the Palestinian-Israeli conflict so as to enhance his personal standing and place Israel under growing international pressure. At that time, Israel strongly objected to Arafat's efforts to internationalize the conflict; yet after his death and succession by Mahmoud Abbas, and especially in the years following Operation Cast Lead, Israel's policy became more receptive to the prominent role played by UNRWA, the UNDP, and other international nongovernmental organizations in Palestinian education, health, and welfare. What this means in practical terms is that COGAT works with UNRWA to develop agreed-upon coordinating mechanisms for the transport of goods for the agency's facilities in the West Bank as well as for the transfer of building materials, food, and medical supplies through Israeli checkpoints at the border with Gaza. Other areas of cooperation include facilitating the movement of local staff as well as releasing goods from Israeli ports. However, materials of dual use are not allowed to enter Gaza, and a list of those items is readily available to anyone. One sphere of extensive cooperation has been in the area of education where UNRWA claims to serve the educational needs of 213,000 Gazan children and 52,633 pupils in the West Bank. Despite COGAT's recent permission to launch 110 new construction sites, including schools and health clinics, UNRWA still lamented: "Years of underfunding have left the education system in Gaza overstretched, with 94 percent of schools operating on a double-shift basis, hosting one 'school' of students in the morning and a different group in the afternoon." However, Israel is not involved in UNRWA's internal technical issues. In addition, the agency is seeking to implement a "Special Children, Special Needs" program to provide dedicated teams of pediatricians, nurses, and counselors to address medical problems, psychosocial issues, and socioeconomic challenges of the estimated 13,000 special-needs children; it also announced a project to promote basic human rights, teaching "nonviolence … conflict resolution and … the importance of tolerance." The Israeli government supports these educational programs because it is strongly averse to the other alternative: Palestinian children attending Hamas schools in both Gaza and the West Banks. Jerusalem believes that, for all of Hamas' penetration of the UNRWA school system, children educated in UNRWA's schools are indoctrinated to a lesser extent with anti-Israel and anti-Semitic hatred than those attending Hamas' own schools, which appear to be little more than hotbeds for terrorism and violence. The established working relationship between Israel and UNRWA largely bypasses the PA and Hamas. On the face of it, it would have been beneficial to Israel if UNRWA's operations were to be entirely transferred to the PA, thus reducing the influence of one of the foremost international perpetuators of the Palestinian refugee myth and underscoring the fact that the "refugees" are now settled in their West Bank or Gaza homeland. In practice, Jerusalem seems perfectly content to sustain the modus operandi with UNRWA and to leave negotiations over the final settlement of the refugee problem until such time as a lasting peace settlement is reached. Baruch Spiegel is a retired brigadier general in the Israel Defense Forces and former deputy head of the office of the Coordinator of Government Activities in the Territories, who served as a senior consultant for several Israeli ministers of defense and as special advisor for regional affairs for President Shimon Peres. Alexander Bligh, "From UNRWA to Israel: The 1952 Transfer of Responsibilities for Refugees in Israel," Refuge, Nov. 1994, pp. 7-10, 24. Michael Comay and Lawrence Michelmore, exchange of letters, Israel Ministry of Foreign Affairs, Jerusalem, June 14, 1967. U.S. House of Representatives, H. Con. res. 29, 111th Congress, 1st sess., Jan. 28, 2009. Ibid. ; Asaf Romirowsky, "How UNRWA Supports Hamas," inFocus Quarterly, Fall 2007; Claudia Rosett, " Gaza Bedfellows: UNRWA and Hamas," Forbes.com, Jan. 8, 2009. U.N. General Assembly (UNGA) A/66/13 (Supp), Mar. 31, 2011. Mitchell Bard, "The Palestinian Refugees," Jewish Virtual Library, accessed June 25, 2012. U.N. Dept. of Public Information, UNGA/SPD/336, Nov. 14, 2005. "Rocket Attacks on Israel from Gaza," Israel Defense Forces, Jerusalem, June 23, 2012.
at the Israel Intelligence Heritage and Commemoration Center (IICC), Ramat Hasharon, Mar. 25, 2009. I. Zagout, "March 2008 Monthly Report," UNRWA Community Mental Health Programme, cited in "Health conditions in the occupied Palestinian territory, including east Jerusalem and in the occupied Syrian Golan," World Health Organization, A62/INF.DOC./2, May 14, 2009, p. 9. "Increased humanitarian aid to Gaza after IDF operation, Jan. 2009," Israel Ministry of Foreign Affairs, Jerusalem, June 26, 2010; "Increased Humanitarian Aid to Gaza after IDF Operation," ReliefWeb, May 30, 2009. The Jerusalem Post, Oct. 22, 2010. "121 projects to improve quality of life in Gaza Strip," News Channels, Israel Defense Forces, Apr. 4, 2011. "Israel approves new package of UN projects for Gaza," U.N. press release, Brussels, Mar. 21, 2012. "Who we are," Coordinator of Government Activities in the Territories Unit, accessed June 26, 2012. "UNRWA: Gaza blockade anniversary report," UNRWA, Jerusalem, June 13, 2011. "West Bank," UNRWA website, accessed July 16, 2012. "Programmes in Gaza," UNRWA website, accessed June 14, 2012. "Human rights promotion," UNRWA website, accessed June 14, 2012. The Washington Times, June 13, 2007. See, for example, Arlene Kushner, "UNRWA: Protesting Too Much," American Thinker, June 17, 2011; idem, "UNRWA Association with Hamas: An Overview," The Center for Near East Policy Research, Ltd., Jerusalem, accessed June 26, 2012. See, for example, The Jerusalem Post, Mar. 1, 2011. Matthew Levitt, "Hamas from Cradle to Grave," Middle East Quarterly, Winter 2004, pp. 3-15. Related Topics: Israel & Zionism, Palestinians | Fall 2012 MEQ receive the latest by email: subscribe to the free mef mailing list This text may be reposted or forwarded so long as it is presented as an integral whole with complete and accurate information provided about its author, date, place of publication, and original URL.